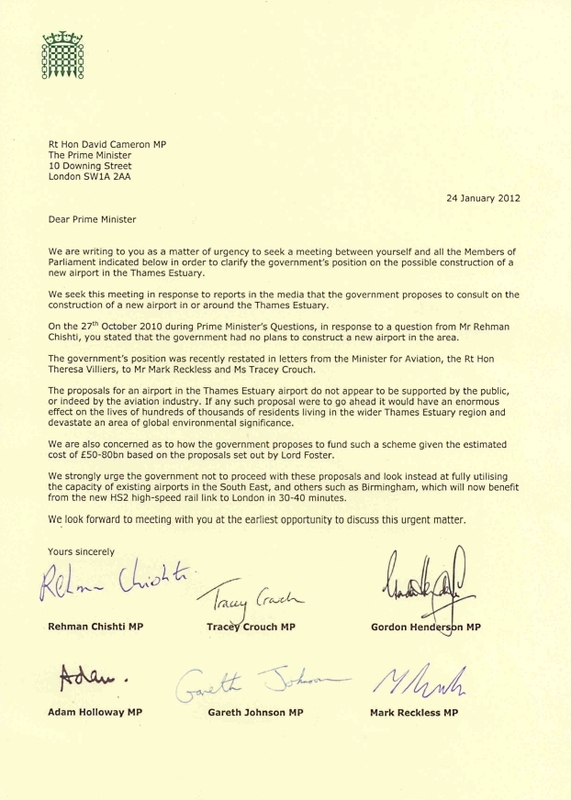 In addition the MP for Rochester and Strood Mark Reckless, Chatham and Aylesford MP Tracey Crouch, Gravesham MP Adam Holloway, MP for Gillingham and Rainham Rehman Chishti and Sittingbourne and Sheppey MP Gordon Henderson have requested an urgent meeting with David Cameron to discuss the proposed Thames Estuary hub airport. This entry was posted in Blog and tagged Adam Holloway, Airport, Gareth Johnson, Gordon Henderson, Mark Reckless, Rehman Chisti, Tracey Crouch. Bookmark the permalink.